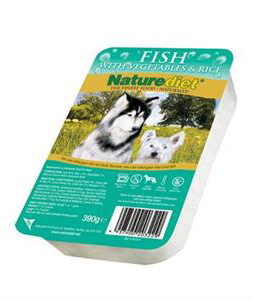 Many dog owners use naturediet alongside a complete dried food and mix the two. There's no real need to do this, and it does make it difficult to make sure that you are not overfeeding your pet, but human nature being what it is, we like to think that wet food is nearer to home cooked! 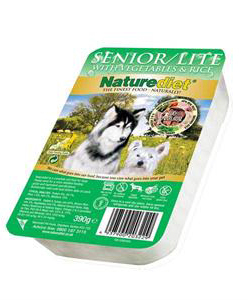 Naturediet is a natural wet food in a tray, and the range is large enough to cover most options from puppy to senior. Ingredient-wise it's pretty good and price-wise it is also a very competitive product when compared with a few other similar ones in fancier packaging! The Naturediet range contains a simple mix of meat, cereal and vegetables, together with essential vitamins and minerals and offers good quality nutrition at an affordable price. Recommended for owners who like to mix dry and moist foods. Expect to pay 75-90p a 395g tray depending where you buy and any quantity discounts available. Fish 65%, Rice 12%, Vegetables 7%, Natural Ground Bone, Seaweed Meal, Vitamin A 2,556 IU, Vitamin D3 213 IU, Sodium Selenite 0.1mg, Ferrous Sulphate Monohydrate 22.7mg, Copper Sulphate Pentahydrate 6.8mg, Manganese Sulphate Monohydrate 5.3mg, Zinc Sulphate Monohydrate 71mg. Technological Additives: Cassia 2,600mg .